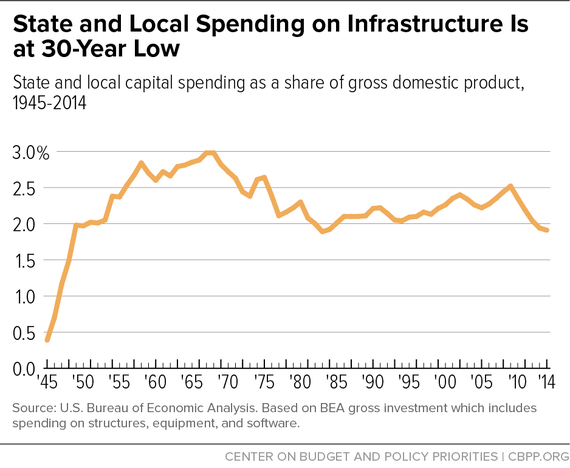 State and local investment in transportation, public buildings, water treatment systems, and other forms of vital infrastructure has fallen to a 30-year low. Reversing this decline is key to creating good jobs and promoting full economic recovery -- and it's an especially good time for states to do it, as we explain in a new paper. The condition of roads, bridges, schools, water treatment plants, and other physical assets greatly influences the economy's ability to function and grow. But rather than identifying and making the infrastructure investments that provide the foundation for a strong economy, many states are cutting taxes and offering corporate subsidies in a misguided approach to boosting economic growth. Tax cuts typically spur little to no economic growth and take money from schools, universities, and other public investments essential to producing the talented workforce that businesses need. States' neglect of infrastructure has serious consequences for the nation's growth and quality of life as roads crumble, school buildings become obsolete, and outdated facilities jeopardize public health. The investment will improve state economies, now and in the future. 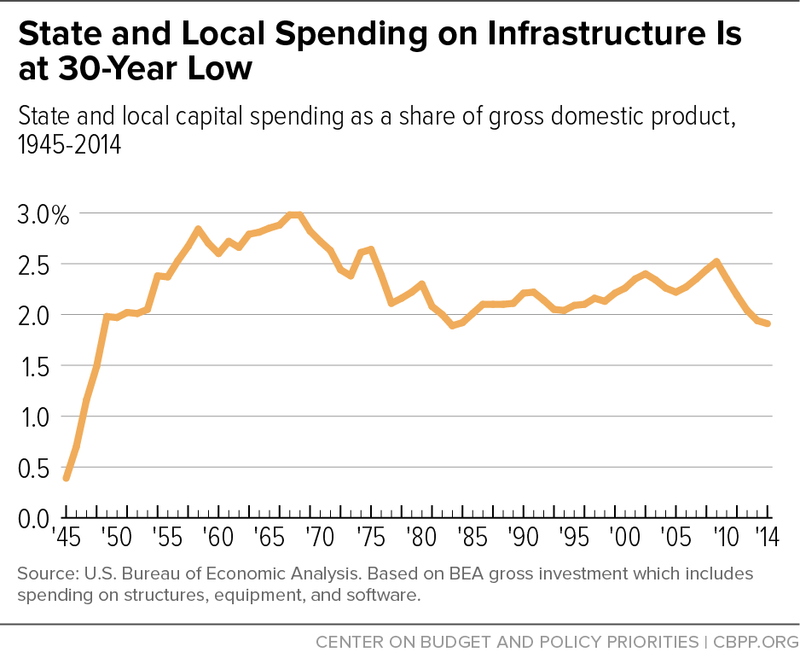 Higher-quality and more efficient infrastructure will boost productivity in states that make the needed investments, lifting long-term economic growth and wages. In the short term, even though the job market is recovering, millions of Americans are working less than they'd like and making less than it takes to get by. Key infrastructure investments would provide immediate job opportunities. Opportunities to finance infrastructure investment abound. States often pay to build new schools, roads, airports, water treatment facilities, and the like using debt, a sound practice for financing infrastructure that can serve generations. Today's historically low interest rates are especially favorable to such borrowing, and state and local debt is below pre-recession levels. States can also use other revenue sources, including user fees (like tolls) and federal grants. States can better afford these investments than in the past several years. State revenues are finally above pre-recession levels, better enabling them on average to afford infrastructure investments. But in many states, revenues aren't sufficient to adequately cover the costs of needed services such as education and health care and still make the necessary infrastructure investments. These states should consider tax increases to preserve public capital that's crucial to long-term economic growth while meeting other needs.